Ah, Etruria - the name of a beautiful historic region that's now part of the equally great Tuscany region of Italy. It was a beautiful waterfront stretch of land from which people traded and kings were born, before intermingling with Rome across the Ciminian Forest, and in many cases, ruling it. If either history or natural wealth speaks to your tastes for a luxury camping site, this is among LUX-Camp's finest offerings, and you should consider it. In some periods it’s possible that the deep swimming pool is only accessible for adults (18+). The shallow lagoon pool will be available for all ages. Why should I take a camping holiday at Camping Etruria? 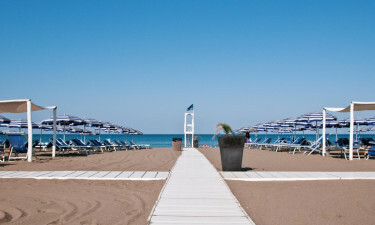 Etruria Beach is a major fixture of the region near Camping Etruria, and it provides a refreshing warmth that's hard to find just about anywhere else in the world. Whether you come to the beach to bathe in the sun atop the sand, or to taste the winds of Tuscany's truly unique seas, Etruria Beach is a sensory marvel, and it's very close by. Etruria has a nice new pool. The supplement for the pool is € 7,00 per person (kids up to 3,99 years are free of charge). You will then get a bracelet which gives you unlimited access to the lagoon style pool and the regular pool (18+) during your stay. 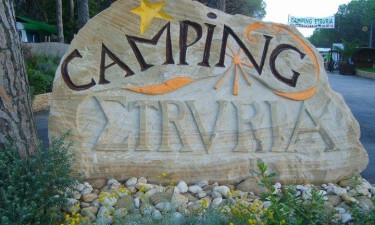 Camping Etruria is a safe, idyllic village that provides a respite from the hustle and bustle of the rest of one's life. From top to bottom, the construction of buildings at Camping Etruria provides a homely atmosphere that makes it a perfect place to stay, relax and enjoy something that is different from what you're used to. Even in its busiest months, it is comparatively peaceful, though for those kids who want to make new friends or people who need a little social stimulation, it's hardly silent. In this respect, Camping Etruria strikes a fine balance. That being said, Camping Etruria still provides hot water, electricity and Wi-Fi. Beyond that, you can even bring your pets: they're members of the family too, after all. In certain mobile homes, you can even get satellite television, for members of the family who need a good, inside way to unwind. 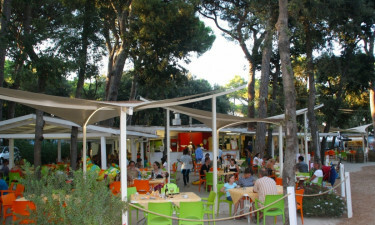 The campsite features its own restaurant, which provides grilled fish and meat. For cooler fare, there's pasta and salads. And of course, there's delicious Tuscan pizza and desserts waiting to be gobbled up. 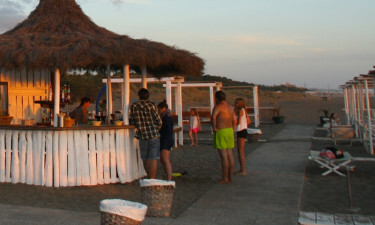 For adults there's a large bar at the campsite itself, plus a second, smaller bar directly by the sea, with snacks and drinks. Though you shouldn't need to worry too much about shopping, Camping Etruria has an authentic butcher shop for meat-lovers and a small market with cheeses, breads, fruit and vegetables, plus local oils, right at the campsite. Fish on Fridays, too.